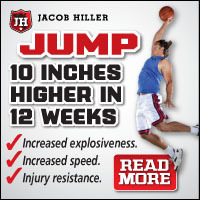 Basketball Agility Drills Made Simple! Most performance coaches in the NBA and NFL use the agility ladder as part of their overall agility training plan. It’s one of the most efficient ways to get quicker feet in ANY sport. If you’re not familiar with the agility ladder, it resembles a a rope ladder with two lines running along the length of the ladder and ropes running across at intervals of approximately one foot. The main advantage of the ladder is that it will expose poor form. If you’re over-striding, under-striding, or dragging your feet, you’ll get caught in the rope. You can find agility ladders at most sporting goods stores for under $40 – but if you’re a baller on a budget, don’t fret, you can make your own pretty easily. Find an open space in your gym, basement or driveway, and place two 10-foot long, parallel pieces of tape down on the floor, about one foot apart. Then place 10 one-foot long pieces of tape across the length of the ladder, creating ten one-foot by one-foot boxes on the floor. The following workout uses six ladder drills that every serious player should know. You can complete it in about six minutes, so it’s easy to squeeze in before practice, after practice, or first thing when you get up in the morning. We’ll start by demonstrating the drills on video, then move onto the written descriptions and some diagrams below. This drill is a good basic one to get started. Simply step both feet into each space of the ladder, one at a time, as you forward. Throughout the drill your knees should be coming up past the level of your hips. Your arms should be pumping fast and hard in a regular running motion. The faster the hands go the quicker the feet will go. To maintain balance and speed, remember to stand erect with a slight forward lean. Complete four lengths of the ladder. This drill is very similar to the Two Step High Knee Drill, but you’ll only be landing one foot in each space on the ladder. Maintain the same form and technique, focusing on keeping your arms pumping and your knees coming up past your hips. With only one foot landing in each space, this will be closer to your normal running form – your stride length will be longer, you’ll move through ladder more quickly. Complete six lengths of the ladder. For this drill only the right leg will be inside the ladder – it will do the majority of the work propelling you through the ladder, while the left leg will stay on the outside for balance and support. Only the right arm should be pumping hard and fast. As the right arm goes all the way back, the right leg should rise up and go beyond the level of the hips. So, you’ll begin by throwing your right arm back, bringing the right leg up with the knee high and stepping into the first space of the ladder. Then the left leg will take just a small step (or it will slide) until it’s even with the right leg. Repeat that sequence for the entire length of the ladder. This drill is the same as the Right Legged Thrust Drill except, with a focus on the left leg and arm instead. The left arm should come all the way back as the left leg comes up. Meanwhile, the left leg should step into the spaces on the ladder while the right leg slides alongside. Important Note: For most athletes, your non-dominant side will tend to fatigue sooner than the dominant side. If you’re tired, slow down, but maintain proper form until the drill is complete. Okay… now we’re stepping it up a notch. This drill is a lot more challenging, and will require some practice to master. Don’t get discouraged if you struggle with it at the beginning. Begin on the left side of the ladder, directly beside the first space. Then step each foot into the first space one at a time (right foot first, then left foot). Continuing right, immediately step each foot outside of the ladder one at a time, (again, right foot first, then left foot). As you step outside the ladder, plant with the outside foot (the right foot) and then step into the ladder’s second space (this time, left foot in first, followed by the right foot). Again each foot should step into the ladder and then outside the ladder (moving through the second space this time). The left foot will plant, and then step into the third space with your right foot. Repeat until you reach the end of the ladder. Tip: Try talking your way through the ladder to coordinate your foot movements. For this particular drill, you could repeat this sequence, “right-left-right-left, left-right-left-right, right-left-right-left…” and so on. This final drill is similar to the one above, but you will only plant a single step outside the ladder before changing direction. Begin the same way as the Double Foot Shuffle. Step into the ladder with each foot, one at a time (right foot, then left foot). Then step out on the other side with just the outside (right) foot. Then, step into the second space with your left foot, step with the right, step outside the ladder with your left foot, and then step into the third space with your right foot. Instead of a four-step sequence, it’s a three-step sequence. So, if you’re talking your way through, it goes, “right-left-right, left-right-left, right-left-right…” and so on. There you have it! A six minute agility workout that will do wonders for your performance on the court.